I just love French Toast for breakfast and this looks amazing! OMG! I am making this for breakfast next weekend. I have this mix in my pantry right now. I love flavored French Toast and this Cinnamon Swirl French Toast just have to make it to our breakfast table next week. That looks absolutely delicious and totally decadent! I LOVE cinnamon anything but this is French toast taken to a whole new level! Yum! I think this looks fabulous! I’m not much of an eggy french toast liker either so I’d prefer to have something with more flavor and less egg! I’ll going to try this! Oh my gosh this looks incredible! 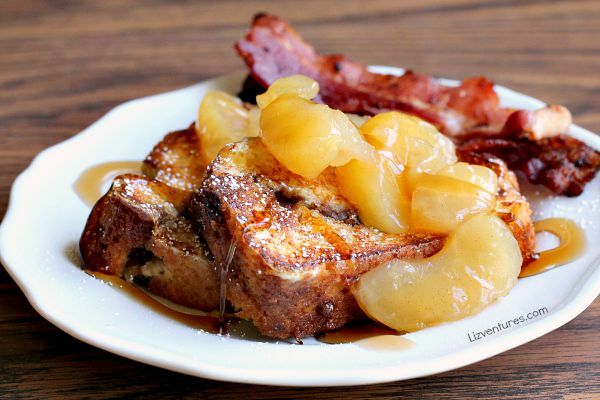 I have not had french toast in ages, Im now going to be craving this all day! What a great idea for French toast! I actually like the “eggyness” of French toast, but still totally want to give this a try! That looks like a really delicious treat for breakfast – I love indulging for breakfast, and would love to try this. Such an awesome idea! My kiddos and hubby don’t know my secret of adding cinnamon to the egg mixture for my French Toast, but they all love it and want it all the time! This looks SO yummy! Love that it’s so easy to make! Oh wow, this looks absolutely delicious! I love anything with apple and cinnamon so this is fantastic – will have to try. I honestly don’t like French toast either. This, however, sounds delicious. Thanks for the recipe. Omg your French toast looks amazingly delicious!!! I so need to give your recipe a try! 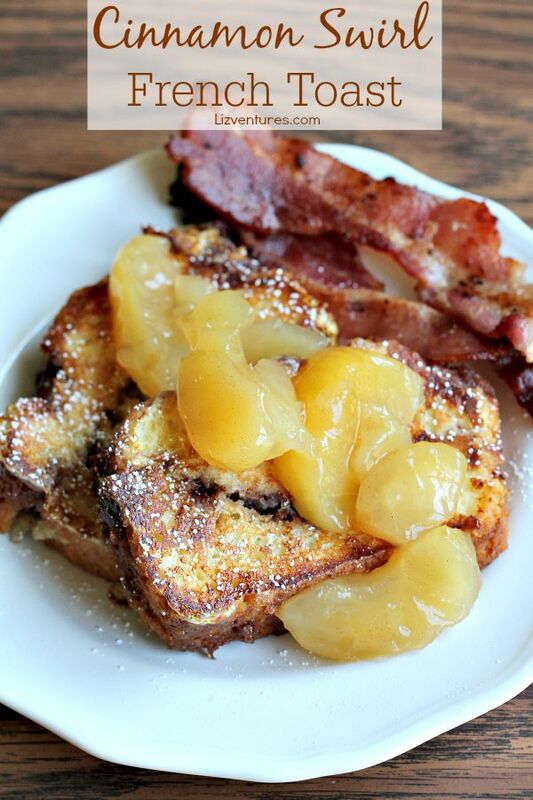 We love french toast so much & this looks absolutely delicious. 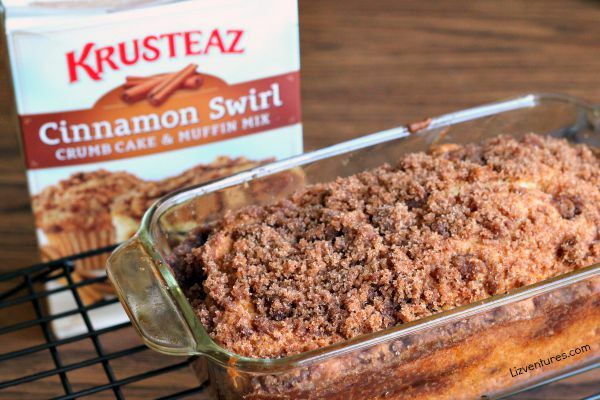 Such a healthy recipe with Cinnamon Swirl Crumb Cake & the combo of Muffin Mix. My kids would love it! Oh my!! This looks amazing and perfect for fall!! Wow oh wow! I bet this is amazing! I love cinnamon swirl bread, and sometimes I do turn it into french toast or french toast casserole. But I’ve never made it myself. I love Krusteaz! Oh, how scrumptious! I love french toast, but it has been ages and ages since I have had it. Oh wow! I french toast with a delightful twist! These looks seriously yummy. I need to try this very soon! May I hire you to be my cook Liz? I would love to taste this yummy dish! French toast is my favorite food! This recipe looks amazing! I will have to try it this weekend. I love french toast. This looks very delicious. Great way to amp up a classic recipe. That looks so good. Kind of like having dessert for breakfast. This might be a Christmas morning breakfast for us! YUM! You’re killing me here!! That looks amazing! The french toast looks really tasty. Cinnamon can really add a lot of flavor to your regular toast. Wow! I would never have thought about anything like that and I love both cinnamon rolls AND french toast. Damn.. I want one now. I love french toast! I usually have it on Sundays as a treat. We love the Krusteaz line of products. I could only imagine how yummy this is. I will have to make this for my kids. This looks like a great choice to put together for this Sunday morning. I think I can get everyone to the table with something that smells this good! These look so good. I want to make these now. Thanks for the great recipe. I already love french toast. But this recipe looks like the best around! Oh my gosh this looks amazing! I would never have thought to add the fruit to the french toast! um. these are insanely delicious looking. i’ve saved this so that i can make these this weekend. Wow! Ok, I have to pick me up some f this tomorrow at the store and make it this weekend! It looks absolutely to die for. I’d be talking about it for days too! How have I never thought of french toast like this before! I love this idea I am going to have to try this out. Wow! It looks super sweet but I don’t mind! I love sweets anyway. Lol. Thanks for sharing this, I would really love to have this in the morning! You literally tortured me with this post! I’m like drooling here for some. Eeeek pregnant woman cravings alert! Everything about this looks amazing. I love French Toast but there is always room to improve it. I think you have made it even more amazing. That looks AMAZING! I love french toast, it’s my favorite breakfast food. Fabulous recipe! 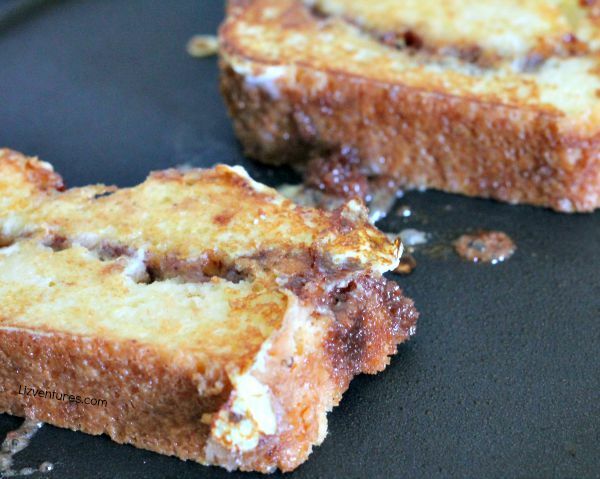 I love cinnamon and I love french toast, so this one sounds like a winner to me! I love french toast, this is a great idea. Somehow the idea of making it with a good bread never occurred to me. I make french toast at home quite often especially when I run out of baking powder and everyone wants pancakes. This looks really good and different we will have to try it out soon! This looks delicious. I haven’t had french toast in a very long time. I need to make some. I totally get the ‘too eggy’ thing. That’s how I feel about French Toast too. This one looks amazing though. I’d try it. Oh man, that looks incredible! I love me some french toast ANY day of the week! It’d be perfect to bake a pan of this up, then save some extra back for some french toast on the weekend, to surprise the hubs! Wow this French toast looks decadent. Just the thing for a holiday brunch. I love making French Toast. It is always a great breakfast treat. I will have to try making this recipe. Yum…. that looks so yummy! I think this recipe would be perfect for holiday! Keep sharing awesome recipes , Liz! We love it! Oh wow, this sounds like heaven lol. Thank you for sharing this recipe! I will definitely give this one try! My husband is a fan of anything cinnamon. He was munching on cinnamon pop tarts this morning actually. He’d be delighted to see that, for sure! I love cinnamon myself. I am so going to have to try these myself – yum! I enjoy a lot Krusteaz products so many good options. This idea of the french toast looks delectable! Oh my gosh, I would want this for breakfast, lunch and dinner! I’m loving this cinnamon french toast! This recipe is picture perfect and is making me super hungry! I love french toast but this is just way better than the traditional versions. I love French toast and it is such a yummy way to start the day. We do bigger breakfasts on weekends when we have time to sit together and enjoy a meal like that. Most everyone in my family loves french toast – except me, mostly for the reason you stated. But if you weren’t a big french toast fan, and you love this, I’m definitely going to try it. Thanks! You are making me wish I didn’t skip breakfast today. This is so adobrale and delicious! Wow this looks and sounds delicious. I love French toast so I’m sure I’d rally enjoy this. It’s one of my faves! I do not like an eggy french toast, too. My mouth watered upon seeing this. I have to make this! My favorite childhood cereal with another breakfast item? How yummy! This is truly a heavenly breakfast. I wish I can try this one out soon! Thanks for sharing this! Okay, first of all, I am right there with you… french toast can taste too eggy, and I do not like that!!! I can make it myself without it tasting too eggy, but I never order it out unless I’m willing to not eat breakfast. This idea sounds like all sorts of goodness. Definitely going to try it out! 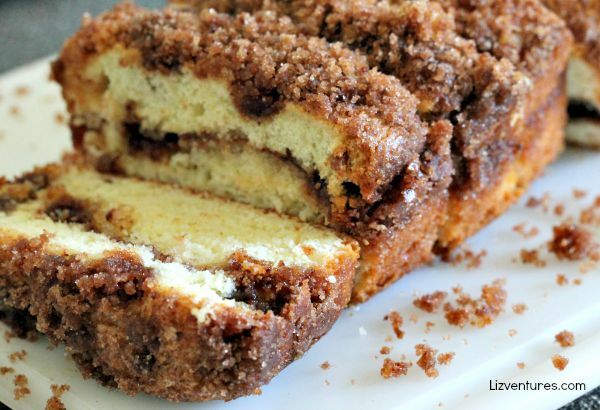 Omgosh, the only thing better than cinnamon swirl crumb cake – cinnamon swirl crumb cake made into french toast! They look delicious! Krusteaz makes such quality products. I’m still irked that some of the larger stores have stopped carrying their products. The cinnamon swirl French toast sounds like just the thing for any day! I’m not an eggy person, either, so I especially like that it needs just a light dip before cooking. Sounds and looks not only delicious but simple too! Perfect for a quick Sunday breakfast before a busy day. So sinfully delicious! My jaw just dropped and I started to salivate at the sight of your pictures. I will have to make something like this myself! Boy oh boy does this look absolutely wonderfully yummy. When you feel like something super sweet and totally bad for yourself, this is it! I think French toast is too eggy too!! Your recipe looks great – thanks! This looks very tasty. Will add to my virtual recipe box. This is simply brilliant! Such an easy way to make cinnamon french toast with less mess! This looks very yummy and something that I’d like to make. The recipe looks easy! This looks so amazing. So I am pretty sure I need to make this! Ahhhh…. Krusteaz is always making life easier and oh so delicious!! Awsome recipe Liz! I love french toast! I haven’t had some in so long! Oh wow, such awesomeness! My family would be thrilled to have this for breakfast. What a delicious and RICH breakfast! Any cinnamon swirl fan will love this! I love French Toast and have tried it many different ways. My son actually prefers it to pancakes so I have to make this for him. OH MY HEAVENS!! Fresh baked cinnamon swirl french toast is SUCH a great idea! I would win mom of the year with this dish for sure! Nice. Looks like a great fall breakfast. Perfect for back to school. That is a brilliant use of a mix to make it soething yummy and healthy. I am totally trying this! Wow, this looks like a great breakfast meal! My husband love making french toast for our kids. My kids absolutely love french toast!! I often stuff the two pieces with cream cheese and fresh strawberries. That looks so yummy and I am suddenly craving for a French toast. Breakfast tomorrow will be French Toast! Yum! That looks so good! To be honest, I do not like french toast either. But I would definitely eat this! I love French toast and I love Krusteaz. I put cinnamon and a little almond extract in my batter but this recipe will definitely be added to my recipe box. Oh my goodness both of these look amazing! My family would enjoy both I am sure! I am now hungry for french toast. Just had a tooth pulled and I cant eat just yet. I love french toast. It is one of my favorite breakfast meals. This absolutely looks incredible. I pinned this one! This looks amazing. I can’t wait to try it! YUMMM! We have french toast for breakfast last weekend but it did not come close to your delicious recipe! Wow! I think we need some breakfast for dinner tomorrow! Liz this is so pretty! I too find French Toast can be a bit eggy. Don’t love that. This would be a perfect fall recipe especially with the cinnamon. Oh heck yes! I actually love french toast but would choose this version over the standard stuff ANY day! The apples go great with fall too. Now that is a delicious way to make french toast! Oh my goodness, what a brilliant idea for a cinnamon swirl french toast. I can taste it now! Wow this looks amazing! I really love French Toast. This looks amazing. I always make our french toast with cinnamon raisin bread so I know already we’d love this a lot. Thanks for sharing, I’ve just got to try this. Okay, this sounds amazing! And so perfect for fall, which is just right around the corner. That looks delicious! I love anything cinnamon. Great for entertaining too as a dessert. THANK YOU! I do not like my french toast too eggy either and my grandmother’s was also super eggy! This is how I leaned to make it so mine tend to be overly eggy as well. I love the Krusteaz brand by the way – I am so going to try this out! You’ve done it again! This sounds like a little bit of cinnamon heaven. I can’t wait to try it. That is perfection on a plate. I love French Toast, but not for the egg factor. I want to fill up with cinnamon or other yummy flavors. I can’t wait to try this one. Wow this sounds fabulous and easy to whip up too! My family loves french toast and I know this recipe would be a keeper! I have never hard of that crumble before! It looks delicious and the perfect topping to a coffee cake! That looks so perfect. I love cinnamon, and I love French toast too. I think I agree with you – I’m not much of a French toast fan, although I do love eggs. That said, this recipe would make me very happy! This recipe looks absolutely delicious!!!! This is definitely one my husband will love and I’ll have to make! Yummmm! This looks so good, melt in your mouth french toast. This looks and sounds yummy. It will make a great Sunday morning breakfast. Thanks for the recipe. Now, THIS is my kind of breakfast or brunch or breakfast for dinner. Muffins are good, but you took that mix to a whole new level. Looks divine! It’s awesome that you can make a muffin hack with the mix. I need to try that! This looks so good. I love french toast. Sounds like a winner for breakfast. The apple pie filling with it sounds delicious! That is such a brilliant idea! It looks amazing – I’ll bet it’s so delicious. I might just have to try it. The cinnamon swirl french toast looks so delicious. I love cinnamon and french toast. What a fabulous combination. I could go for some right now! This looks so amazing. I bet it smelled good too. I’m going to pick up a box and make it for our Sunday breakfast. I would have never thought to toast the cinnamon bread like that. I am sure it was delicious. Ohhh this looks yummy! We love cinnamon and this version of french toast looks amazing. I will have to make this for my family this weekend! My mom always made eggy French toast, so I like it that way. My kids complain every time I make it like that LOL. I will have to make this for them and see if they like it – I bet they will. That looks like the best breakfast ever! I think it’s total genius to use a cinnamon bread like this as a base fro French Toast. Yummy! Agreed. I never thought of doing it, but it’s really a brilliant idea. This has got to be one of the best ideas I’ve ever seen for French toast! Talk about doing it up! What a delicious looking breakfast. It would be so delish to have on a cool, crisp fall day – a good one to make for a family breakfast! OMg we love Krusteaz products. I am so trying this for breakfast tomorrow. It does look super delicious and I love Krusteaz products. I think I”ll have to look for this. That looks fantastic! You know, I’m the opposite when it comes to egg, so I would let that bad boy get good and soggy first. LOL. Ok that is just an awesome idea!! I would have never thought of doing something like this! I just use boring ol’ bread! I will be using this recipe next time! That looks amazing! I’ve never thought of making French toast with anything other than bread before. Yummo! Oh wow, that looks so delicious! I also don’t like it when my French Toast is too Eggy. I’ve tried the Krusteaz cookie mixes, but I haven’t tried this mix yet. This sounds amazing for French Toast! I know EXACTLY what you mean about an ‘eggy’ French Toast…I hate that! I would always tell my Mom to make mine ‘dry’ and if you can’t, I don’t care if you flatten it until it’s dry. When I go to a restaurant, I hold my breath when ordering it because I don’t want it to ‘eggy.’ Your recipe looks good!